Although James Ellroy’s novels have been turned into films before, most notably LA Confidential (1997) and The Black Dahlia (2006), Rampart is his first screenplay, co-written with director Oren Moverman, who also wrote Jesus’ Son (1999) and I’m Not There (2007). 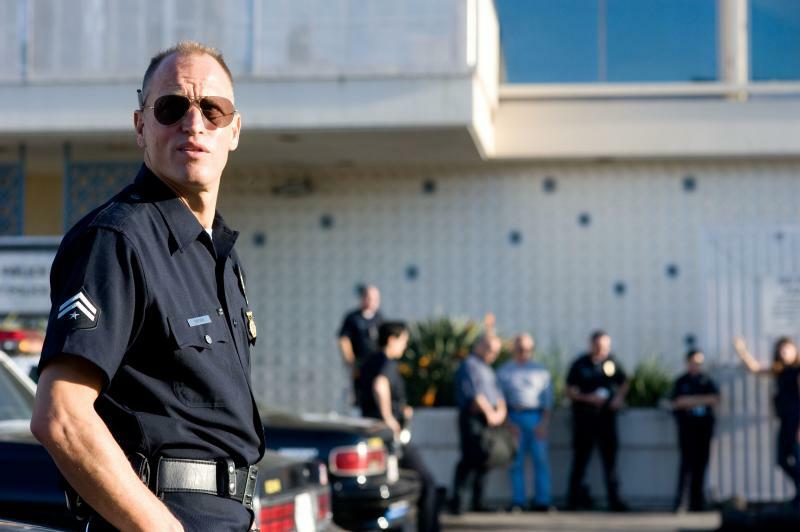 Ellroy claims the film is his most personal work to date, and the lead character, maverick LA cop Dave Brown (Woody Harrelson), certainly resembles the author, with his balding buzz-cut and scabrous wit. He is the epitome of the Ellroy flawed anti-hero - like LA Confidential‘s Budd White (Russell Crowe), but without his intelligent and politically savvy counterpart, Guy Pierce’s Ed Exley, to guide him. This classic Hollywood masculine protagonist is the descendent of John Wayne’s Ethan Edwards in The Searchers (1956) and Clint Eastwood’s Dirty Harry (1971). Rampart is essentially a character study of this violent man of action who makes the world safe for civilisation but can never really be part of it. Brown’s relationship to the home is at the core of the film, as much as his work in the streets of Downtown LA. Although such characters normally have no place in the ‘feminine’ civilised world, at the start of the film he is at least on its threshold. He lives next door to his family - two sisters with whom he has fathered two children (both daughters) - and is invited in for meals, but sent home again if he gets too aggressive. The famous last shot of The Searchers, when the door closes on John Wayne outside the home, is echoed here to heartbreaking effect. Read Michael Almereyda’s text on The Searchers‘ final shot, illustrated by Sean Azzopardi, in The End: An Electric Sheep Anthology. The film is shown from Brown’s point of view, with Woody Harrelson, dominating every scene and giving the performance of his life, somehow imbuing this violent, bigoted misanthrope with personality, charm and humour. Whether battering criminals, seducing women, endlessly smoking, looking old and vulnerable with reading glasses, panicked and paranoid, or off his head on drugs, we are given a real roller-coaster performance that should be showered with awards. For a film that is all about the Hollywood (anti-)hero, Rampart gives him very little to do. James Ellroy’s convoluted plots and political machinations, which drive The Black Dahlia and LA Confidential, are discarded. The real-life ‘Rampart Scandal’ of the late 90s - a tale of police corruption and cover-ups in the precinct of that name - seems almost tailor-made for Ellroy, but is merely the backdrop here. Brown is never going to get to the bottom of such layers of intrigue; in fact he barely even scratches the surface of the mystery. He is left to rage impotently against forces he can neither stop nor understand. Oren Moverman, directing his second feature (his debut was the 2009 Oscar-nominated The Messenger, also with Harrelson), shows what a great talent he is. The hand-held realism at first appears rough and ready. The natural lighting, provided by Californian sunshine, reveals why the film industry moved to Hollywood in the first place, while the overlapping dialogue and actual LA locations, complete with quirky piano bars and flamenco restaurants, further add to the film’s realist style. But the, at times, strikingly unusual framing and imaginative use of close-ups - putting us almost tangibly in the middle of the action (particularly disconcerting in the toe-sucking scene and the how-not-to-eat a burrito scene) - showcase Moverman’s great visual sensibility. He is also adept at building a convincing sense of confusion and paranoia, mostly by leaving much of the story untold. Although it perhaps does not go quite as far as 1992’s Bad Lieutenant (a film Rampart has much in common with), this film takes the maverick cop character to its conclusion. It is a warts-and-all depiction, but with moments of real humour, and even pathos.